People who love wine generally consume more of it at home than anywhere else. And regardless of the quality of their glasses or the extent of their cellars, those who most enjoy wine at home share one attribute: a commitment to drinking it. Many people who profess to value wine break out bottles only on special occasions, or on weekends. But people who really love wine think of it as an ordinary part of their meals, like salt or bread. Regular consumption is the single most important characteristic of the confident wine lover. The benefits of commitment far outweigh a primer on proper glassware or schematics for pairing food and wine. Drinking wine regularly develops your critical ability and your sense of your own taste. And it helps answer the crucial question: Do you like wine enough to want to learn more about it? If you do like it, the repetition of pouring a glass with a meal becomes a pleasurable learning experience, which in turn leads to a greater sense of confidence. That, more than anything, improves the experience of drinking wine anywhere. Regular wine consumption does not mean you need to drink a lot. It could be just a glass with dinner. Or a couple could share a bottle, which, like the 90-foot baseline in baseball, is just the right proportion: Two people can generally finish a bottle happily rather than woozily. 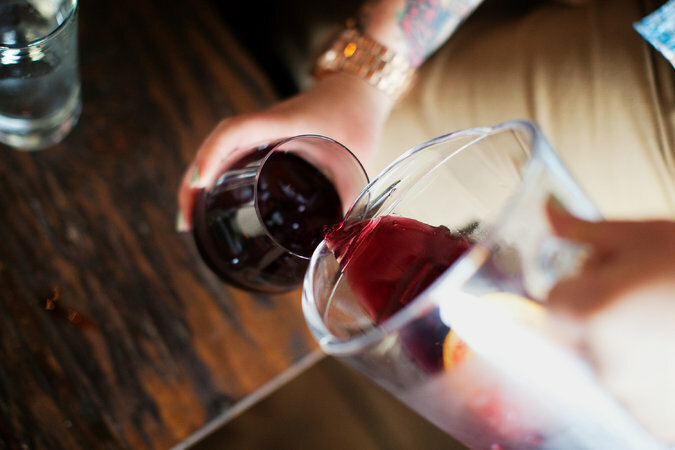 Either way, or anywhere in between, regular drinking renders wine ordinary in the best sense rather than extraordinary. Some people may shy away from regular wine drinking as self-indulgent or hedonistic, and they would not be wrong. Good food is pleasurable, and good wine enhances that pleasure. But wine is not the end itself. Adding wine as an ingredient of a good meal diminishes the need to focus on it. For regular drinkers, wine is no longer a novelty. It’s simply a supporting player in an ensemble cast that includes food and those with whom you share it. You want good wine, of course, but good wine does not have to be profound, attention-grabbing or expensive. Exciting bottles are not hard to find for $10 to $20, although most are closer to $20 than $10. If you are sharing the bottle among several people, it does not add up to a great deal. Still, if drinking well at home requires commitment, part of that commitment is financial. But the investment does not have to be great, especially with equipment. You could drink wine out of juice glasses if you wish, though the experience improves greatly with good stemware, which doesn’t have to be expensive. Similarly, you can spend hundreds of dollars on meticulously engineered corkscrews, but a basic waiter’s tool for about $12 will reliably open anything. You don’t need to own a lot of wine to drink it regularly. If you have a mixed case of wine on hand — reds, whites and a sparkler or two — you don’t need more. Replace as needed, preferably by becoming a regular at a good wine shop and developing a beneficial relationship with a knowledgeable merchant. Don’t worry that wine will be ruined if you leave it in an open bottle for two or three days. Wine, especially young, fresh wine, is sturdier than we imagine, and so doesn’t require special pumps, stoppers or other knickknacks marketed as preservers. Older wines are more fragile and should be saved for occasions when they can be consumed in one sitting. The time may come when, having decided that you love wine and want it to be part of your life, you begin to buy a lot of bottles. The wine itself is the most important investment, but to care properly for the wine, especially bottles that you want to age, you will need long-term wine storage. If you have a house with a cool, damp cellar, you’re in luck. Just keep your wine there in whatever sort of shelving you choose. If you live in an apartment, it will be worth getting a wine refrigerator (or two), or off-site storage. Inevitably, loving wine costs money. But if you love it, the money is well spent.